My friends are always trying to find ways to get on the blog…and my friend Natalee wins the prize this week. She’s working on her first garden and planted enough zucchini to feed most of the Bay Area for the summer. She decided to give me her state-fair-worthy zucchini…not because she likes me more than anyone else. She just wants some blog exposure, and she deserves it. This zucchini makes my strawberry look like a raspberry! I just love summer and fresh produce. 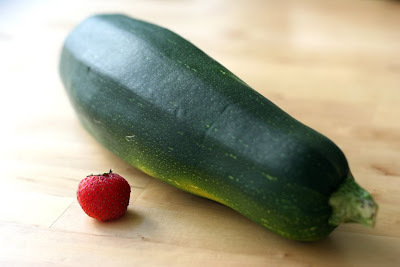 that picture makes me want to grab that giant zucchini and squish that silly little raspberry! I can’t tell you how excited I am to make the blog! 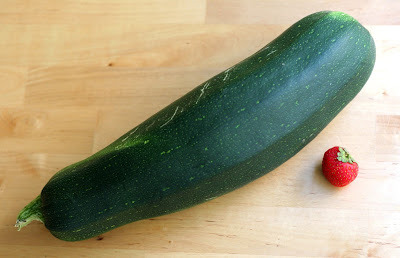 I will say that the zucchini is even bigger in real life than it looks here(despite the fact that I found the smallest strawberry possible!). I’m thinking of hitting the state fair circuit–I hope you haven’t eaten it yet! mmmm…zucchini..i love it. just made some yummy zucchini bread and some yummy chocolate chip zucchini muffins.